Tankless or on-demand hot water delivery systems are growing in popularity. The reason for all the excitement is their delivery of an endless flow of hot water with the added benefit of being extremely energy efficient since it only heats the water you are going to use when you are going to use it. This reduces fuel consumptions and the amount of exhaust gases that would be vented into the atmosphere. 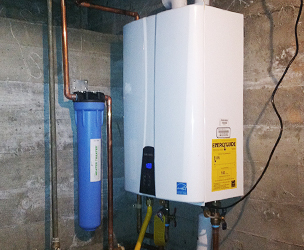 Manufacturers claim up to 40% in energy savings over the cost of a standard hot water tank. This is true in high use situations but for the low to average user the number is more likely between 25% to 35%. The savings will allow you to recover the extra cost of installing the system in 5 – 7 years. It is a longer term investment and if cost recovery is a factor in your decision, it is a good idea for a family that plans to be in their current home for at least. Keep in mind, the enjoyment will start immediately! There is a lot of information we can offer you to help you learn more about these systems. Visit our page on pros and cons or look at our FAQ page on hot water. Here we answer the most common question and a few less common ones. A cost versus benefit comparison may be just the thing to help you make your decision. R&B estimators are happy to give you a no charge, no obligation quote and all the other information you need to decide if this type of hot water heating is for you. At R&B Plumbing, our technicians have been specially trained to install, service, and repair these systems. Whether you are considering a single room application or a whole house R&B can help you decide if they are right for you.